Photographers and creators of 2-D and 3-D works that can be suspended are eligible. The coalition maintains two galleries that host several shows a year: one located in the windows of Bay State Savings Bank facing Franklin Street and the other in the basement level of Worcester City Hall just off the building’s parking lot basement. “Fire and Ice” will be presented in conjunction with the city’s Festival of Lights celebration. Landscape, fine art, and street photographer and Clark University Professor Frank Armstrong; photographer and Worcester State Professor Catherine Wilcox-Titus; and public art administrator & Art in the Park project manager Gloria D. Hall will serve as jurors for the show. Photography and artwork will be displayed for three months with a special opening reception on Dec. 1. Up to 30 photographs will be displayed. Art work (any medium) must depict your interpretation of “Fire and Ice” and must not have been previously exhibited in a Worcester Windows gallery. Submissions will be accepted until 11 p.m. Nov. 15. Artists will be notified Nov. 20, and the exhibit period is Dec. 1-Feb. 23. Mustang Bio, a biotech company focused on the development of novel cancer immunotherapies, has entered into a lease agreement with the UMass Medicine Science Park in Worcester for a manufacturing facility to support the clinical development and commercialization of the company’s products. The facility is expected to be operational next year. Mustang anticipates initially building cell-processing capabilities to support its lead product candidates MB-101 in glioblastoma, and MB-102 in acute myeloid leukemia and blastic plasmacytoid dendritic cell neoplasm. Mass Mentoring Partnership, a statewide organization dedicated to expanding empowering youth-adult relationships, has awarded the $20,000 ALKU Scholarship to Daniel Mbusa, a senior at North High School. Mbusa is a mentee through African Community Education in Worcester. The award, payable over four years, is given to rising high school seniors who plan on pursuing a bachelor’s degree at a four-year institution and demonstrate community involvement, work and leadership experience, and financial need. The candidate must also be involved in an empowering relationship with an adult. Mbusa and his family came to the United States in 2013 as refugees from Uganda. His father passed away in 2015, leaving his mother to raise five children alone. He has tried to help his mom while continuing to maintain high grades in his classes. He has been matched with his mentor, Frank Murphy, for four years. Murphy has connected Mbusa to educational and community programs as well as helping him complete college applications. He hopes to use the scholarship award to study the sciences in college. MassDevelopment is accepting applications for matching grants to eligible organizations that will create innovative programs to educate students and adults about career options in advanced manufacturing. The grants are the sixth round available through the AMP it up! campaign, which promotes advanced manufacturing as an attractive career path to students and young people. Click here to view the application. In a complementary effort to promote careers in advanced manufacturing, MassDevelopment is holding a fourth edition of the AMP it up! Video Challenge, which invites students to research the inner workings of an advanced manufacturing innovation and show in a two-minute video how it impacts the world around them. An online balloting tool will allow the public to help determine the winning videos, which will earn cash prizes donated to their schools. The top three videos will each win $5,000 in funding for a total of $15,000 in prize money. “AMP it up! is a creative, engaging way for young people and students to discover the rewards of pursuing advanced manufacturing as a career path,” said Housing and Economic Development Secretary Jay Ash. Eligible applicants for the AMP it up! grant program must be Massachusetts-based nonprofit organizations that address education and workforce issues. The application deadline is Dec. 1, and grant awards will be made in January. In the first five rounds of grants, MassDevelopment provided more than $470,000 to 49 partnerships across the Commonwealth. For more information about the program, visit the AMP it up! website. The Central Mass. Parent/Professional Advocacy League is offering a series of support groups for parents raising a child with behavioral health. 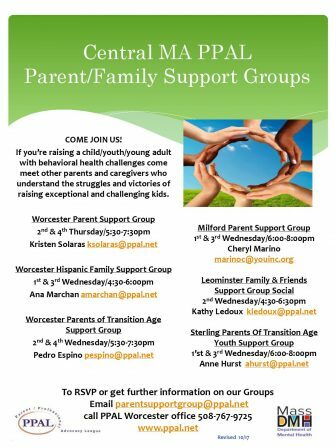 The Worcester Parent Support Group meets 5:30-7:30 p.m. the second and fourth Thursdays of the month. For more information, email Kristen Solaras. The Worcester Hispanic Family Support Group meets 4:30-6 p.m. the first and third Wednesdays of the month. For more information, email Ana Marchan. The Worcester Parents of Transition Age Support Group meets 5:30-7 p.m. the second and fourth Wednesdays of the month. For more information, email Pedro Espino. The Milford Parent Support Group meets 6-8 p.m. the first and third Wednesdays of the month. For more information, email Cheryl Marino. The Leominster Family & Friends Support Group Social meets 4:30-6:30 p.m. the second Wednesday of the month. For more information, email Kathy Ledoux. The Sterling Parents Of Transition Age Youth Support Group meets 6-8 p.m. on the first and third Wednesdays of the month. For more information, email Anne Hurst.